Sung texts and English and German translations available online. I have lost count on how many issues in Franz Hauk’s series with the music of Johann Simon Mayr have come so far. I haven’t heard them all but I have from the beginning been fascinated by them and am eagerly waiting for the next issue. Since Mayr was an enormously prolific composer I am certain that there is more to come. 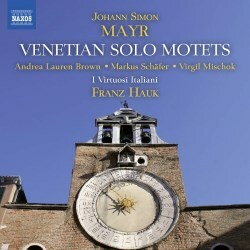 This latest disc offers eight solo motets written for Venice when Mayr was still relatively young. As always his music is attractively melodious and the scoring is excellent and inventive, in particular his writing for the wind instruments puts a distinct personal stamp on the music. We recognise the soloists from previous issues in this series. American soprano Andrea Lauren Brown, a reliable name in this repertoire, carries the heaviest burden, while the just as reliable tenor Markus Schäfer relieves her in two numbers. Andrea Lauren Brown is on excellent form throughout with beautiful, steady tone and technical skill. She is also required to indulge in some coloratura, and in Exsurge, anima (tr. 2 – 4) in particular the last movement is a charmer. In Salve Regina in F major she is joined by the lyrical bass Virgil Mischok, light of tone and mellifluous. Most of the individual movements within the pieces are very short, sometimes frustratingly so, but better that than prolong them and tire the listener out. Mayr seldom overcooks his dishes. Me miserum, quid hoc (tr. 6 – 9) with a recitative and three arias, is one of the most interesting works here. The wind instruments colour the music with their chatting commentaries and the arias are nicely contrasted. The second aria (tr. 8) is short and beautiful and in the third, just as short as the previous one, there is a lot of coloratura, cheered on by the eager winds. Markus Schäfer’s mellifluous lyric tenor is ideally suited to the rather mild Salve Regina in B flat major (tr. 10). He sings elegantly, never forcing his beautiful voice, but halfway through there is a sudden break with a dramatic outburst, which he manages just as elegantly. Then back to the more relaxed atmosphere. Andrea Lauren Brown returns with O Deus, quot circumdant: a dramatic recitative, followed by two beautiful arias, the second, Andante grazioso, especially attractive. And the work concludes with a jubilant In dulci jubilo with exuberant coloratura. But to my mind they have saved the best pieces for the conclusion. Here Mayr is at his most personal. The Salve Regina in C major is a festive tour de force with virtuoso singing by Andrea Lauren Brown, backed up by only wind instruments and a bass viol. This is a winner! And so is Qual colpa eterno Dio. It is sombre and dramatic to begin with and Markus Schäfer delivers strong and assured singing, but as always with plenty of nuances. Gradually the music changes character and the piece ends on an optimistic tone. I Virtuosi Italiani, playing on historical instruments, are excellent and Naxos’s recording cannot be faulted. Collectors of this series can rest assured that this issue is on the same level as previous instalments. A humble question though: Why did we have to wait more than four years for its release? But now it is here and we can enjoy the result wholeheartedly. Next, please!